Up to 12 hour ultra long lasting lipstick. A lipstick that stays in place all day and doesn’t lose its ?just applied look’. No other lip colour has the staying power of Lipfinity, an ultra long lasting and vibrant lip duo that together create a smooth, sheer finish for up to 12 hours. With semi permanent colour and a shine boosting, moisturising topcoat there’s no need to reapply, even after eating and drinking throughout your day – no matter how long it is, your lipstick’s still on. The colours are bold and the effects are pretty striking. I have been using number 40 and it's pretty bold. For this reason, I would recommended it for evening rather than daytime wearing. I found the texture to be a little dry and therefore it did not moisturise my lips as much as I thought it would. The lipstick stayed in place without me reapplying it for a couple of hours, but this might be improved with a lip primer. Overall, I thought this lipstick provided a lot of bang for the proverbial buck! Hard-working lipstick at a great price. I found this and thought - WOW! I hardly wear lipstick as it doesn't suit me and is just a pain, I can't seem to apply it correctly. This one is different. It really does work. Obviously if you smoke, drink, kiss or other fun things with your mouth the lipstick will wear away faster than 12 hours, but all in all it lasts a long time. 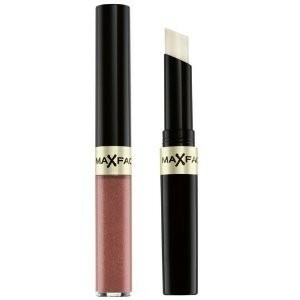 It comes with a gloss stick too so once you have put it on it changes from a matte finish to a glossed finish. It has always and will always be one of my favorite lipsticks. Comes with a gloss stick. Doesn't do much for moisturising. Works well, just make sure you want to wear it when you apply it else you're stuck with it! Long lasting, great colours, works really well. I have to admit, I rarely wear lipstick as I find it can be a nightmare to keep re applying and also my lips easily dry out so always stuck with lip gloss. I needed a lipstick for a celebration and I came across this and I was actually really pleased with it. My lips had a lovely coat which lasted longer than I expected and the top coat gave a nice sheen to my lips which lasted quite a while. Highly regard this lipstick, especially as I am not a massive lipstick fan. "The colours are bold and the effects are pretty striking. I have been using number 40 and it's pretty bold. For this reason, I would..."